MB Seminary works together with Mennonite Brethren national and provincial leaders, pastors, and others from Mennonite Brethren churches around the world to produce devotional books that are designed for families and individuals. These books are produced for the Easter (Lent) and Christmas (Advent) seasons. The Scripture texts are sometimes taken from the Revised Common Lectionary or the devotional will span a book of the Bible. 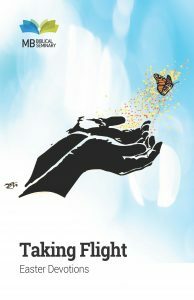 Taking Flight is a devotional book designed for daily use during the season of Lent. 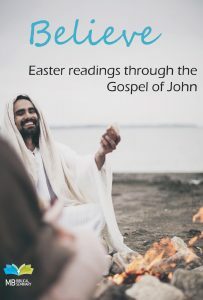 Written by 47 individuals from the MB family across Canada, this book will lead you through the entire Gospel of John beginning on Ash Wednesday (March 6) and concluding on Easter Sunday (April 21). Many of these devotions were previously published in MB Seminary’s 2017 book called Believe, but this updated edition features seven new entries and numerous revisions. The devotions are intended for readers of various ages so that families and small groups can interact with the themes and consider applications together. The deadline to order print copies of this book has passed. We order a small quantity of extra books in case churches contact us after the order deadline. Please email communications@mbseminary.ca to see if additional copies are available. 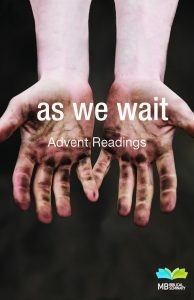 As We Wait is the title for the 2018 Advent book that led readers through 24 daily readings selected from the Revised Common Lectionary (December 2-25). The devotions were written by member of our MB family from across Canada. Thanks to the visionary generosity of a financial supporter of MB Seminary, ten complimentary copies of this book were sent to every MB church in Canada. 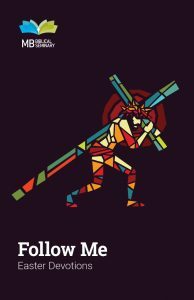 Follow Me is an Easter devotional book for the season of Lent, written by members of the MB family from around the world. Beginning on Ash Wednesday, this book will guide you through 47 different devotional readings and take you through the entire Gospel of Mark. Authors from Canada, the United States, Brazil, Colombia, Austria, Lithuania, and Germany will invite you to renew your faith, take up your cross, and follow Jesus. Jesus Messiah: Christmas Devotions is a devotional book arranged by MB Seminary for families and individuals who want to take time for reflection during the Christmas season. 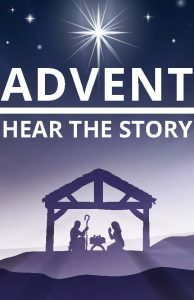 Although Advent begins on December 3, 2017, Jesus Messiah begins December 1 and ends December 31. Readers will enjoy reflections from the Old Testament that will emphasize God’s call, God’s heart, and God’s promise to redeem. 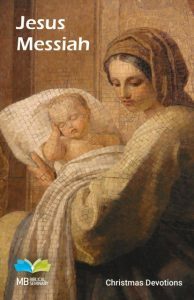 Traditional Christmas readings from Luke’s Gospel and Matthew’s Gospel will remind the reader of the amazing story of the birth of Jesus and even the stories that followed his birth. Thirty-one different authors from the Mennonite Brethren family across Canada have written these devotionals for you, your families, and friends to enjoy this Christmas season. Believe is an Easter devotional book of 47 reflections the Mennonite Brethren family across Canada, covering the entire Gospel of John. Craig Keener writes, “Throughout John’s Gospel, many people become initial believers, but their initial faith proves insufficient without perseverance. John’s goal is not simply initial faith but persevering faith, discipleship. John’s purpose is to address believers at a lesser stage of discipleship and to invite them to persevere as true disciples” (Craig Keener, The Gospel of John, 1216). Keener’s insight of a persevering faith is at the heart of why MB Seminary is offering this resource. Whether you call it the “season of Lent” or “the weeks leading up to Easter,” we invite you to take the time to read through the Gospel of John and believe. 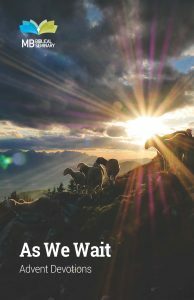 As We Wait is an Advent devotional book with 29 reflections from the Mennonite Brethren family across Canada. Scripture texts for each reflection were taken from the Revised Common Lectionary. The title “as we wait” carries an unfinished sentiment that invites the reader to anticipate the coming of Jesus in active ways that are consistent with what we are truly waiting for, thus the non-traditional cover (getting your hands dirty). The four themes that our contributors explored and reflected on are: Watch, Prepare, Proclaim, and Worship. Hear The Story is a four-week (27 day), family-friendly devotional book that uses the Scripture readings from the Revised Common Lectionary. The traditional themes of the Advent season guide the emphasis of each of the four weeks: hope, peace, joy and love. Each week the flow of the biblical texts allows for the readership to experience a movement from Old Testament prophesies and/or promises to New Testament fulfillment in Christ. All 27 reflections are written by our Mennonite Brethren family across Canada. We hope you enjoy hearing the story all over again. 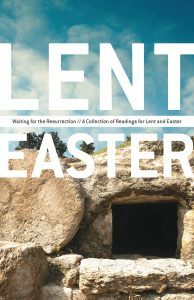 Waiting For The Resurrection is a collection of readings for the season of Lent. Beginning Ash Wednesday, these 47 devotionals will guide the reader through various thoughts and reflections leading up to Good Friday and Easter Sunday. Each Sunday provides the reader a pause from the Revised Common Lectionary Scripture texts with a poem or reading from various authors. The free PDF download is the 2016 reprint version of this devotional book.